Rachel Notely is fighting back against allegations her party will cripple the energy industry by reviewing oil and gas royalty rates. Alberta NDP Leader Rachel Notley says Premier Jim Prentice is fearmongering when he accuses her of turning her back on the oil industry and job creation. Notley has said that if she wins next Tuesday's election, she will hold a review of the province's royalty structure to ensure that Albertans are getting a fair return for their non-renewable resources. Prentice says a review would hurt the industry and undermine public confidence in Alberta. Royalties are paid by energy companies to develop the province's oil and gas resources. "Albertans know that the last thing that this province needs right now is a royalty review because it will undermine business confidence at the very worst possible time," the Tory leader said during a campaign stop in Calgary on Tuesday. "The last time we did this it cost us billions and billions of dollars of investment and thousands and thousands of jobs. It's the last thing we should do." The government of former premier Ed Stelmach increased royalty rates in 2007, but rolled them back after major criticism from the oil and natural gas industry and a serious loss of investment in the province. Producers suggested royalty increases compounded the effects of falling demand and low prices during the 2008 economic downturn. 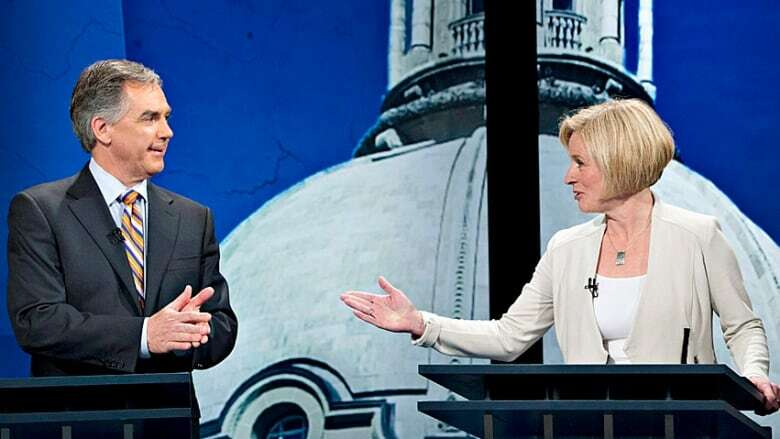 Notley, who was also in Calgary, scoffed at Prentice's criticism. "I think he's definitely fearmongering, but I don't think Albertans are buying it," she said. "I don't exactly know how a review would be devastating one way or another. I don't know how talking to Albertans, with Albertans, in an independent, transparent accountable forum about a resource that belongs to Albertans is going to kill the industry." Prentice called the election a year earlier than required to gain a mandate for his budget, which he calls a transformational blueprint for the next decade. The theory was Prentice would cruise to another majority with the opposition in disarray, but polls are suggesting there's a tight, three-way race among the Tories, Wildrose and NDP. Notley, whose party has never held more than 16 seats in Alberta, is coming off a leader's debate last week that most pundits say she won. The Progressive Conservatives have since been hammering away at the NDP on energy matters. Prentice chided Notley on Monday for her promise to take a hands-off approach on two pipeline projects to get Alberta oil to the coast. He said she is following in the footsteps of the NDP in other provinces. He pointed to British Columbia where the New Democrats are against the Northern Gateway project, and to Manitoba's NDP government, which has intervener status at hearings into the proposed Energy East pipeline. Notley said on the weekend that her party would move away from the Northern Gateway pipeline, which would take oil from Alberta to tankers on the B.C. coast. She also said she would let the Keystone XL pipeline debate play itself out in the United States. The Keystone line would take oil from Alberta to refineries and ports on the Gulf Coast. She suggested there is more potential for Energy East, which would take product to refineries in Eastern Canada.